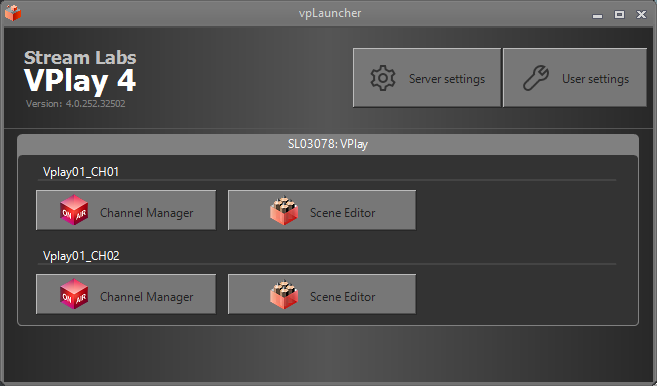 VPlay 4 is multifunctional and at the same time simple for use server for multi-format, multi-channel broadcasting with graphics overlay capabilities. It supports all major audio/video input signals and widespread formats of media files. Playlist in a loop with possibility of fast switching between playlists. Client-server architecture - control of the server by client software either locally or remotely. Playback of media files in various widespread formats combined in one playlist. In addition, users of VPlay will be very comfortable with the scheduling, namely: editing of current schedule on a fly, forward scheduling for unlimited number of days, remote scheduling using built-in editor, import from different formats, and jump to any selected element of the schedule. All these are just a small fraction of the capabilities of VPlay. Simultaneous and independent operation of several channels. 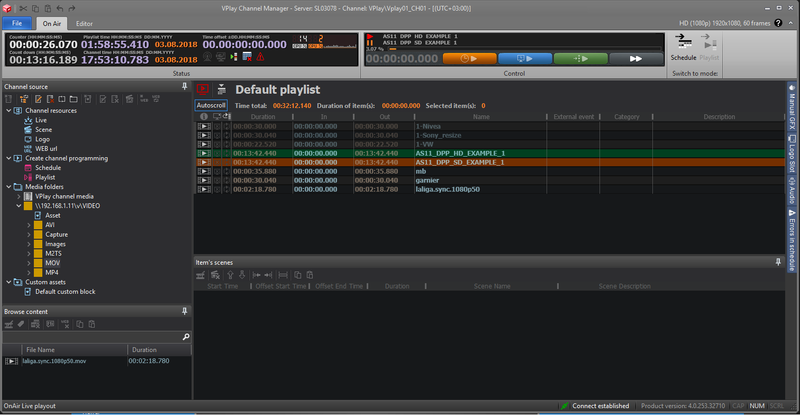 Remote scheduling and use of built-in editor of Vplay Channel Manager. Remote scene editor for graphics overlay Vplay Scene Editor. Playback of major widespread media formats. Possibility to use single capture card for AV-signal for several channels simultaneously. Setup of conversion for the format of input AV-signal separately for each channel. IP and WEB broadcasting concurrently with AV-signal, with adjustable stream bitrates, resolution and bitrates. Possibility for visual monitoring of any input and output in real time. Jump to a playback of any selected element in the schedule. Separate VPlay Channel Manager for each TV channel. Link of graphics overlay to elements of the schedule using “secondary events” technology. User interface with flexible positioning of application windows on a PC monitor. Possibility for work in multi-monitor mode by positioning of panels on different areas of the monitor(s). Displaying of last element for previous day and first element for next day while editing current day schedule. 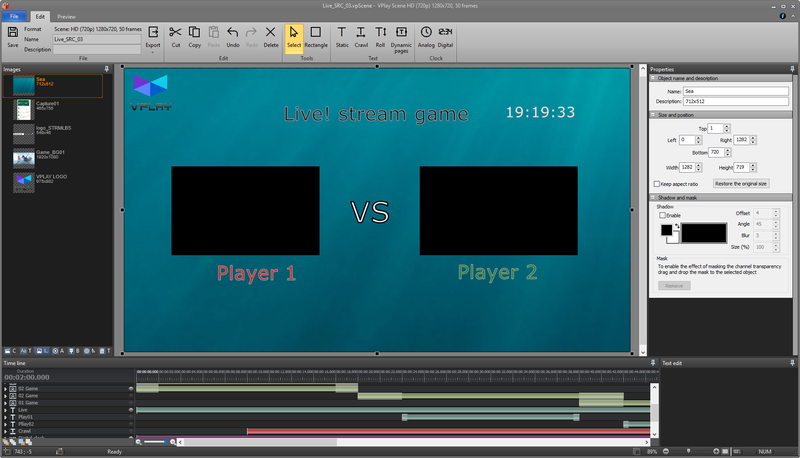 Support of mixed elements in a schedule: media clips, Live inputs, empty slots, events with manual control. 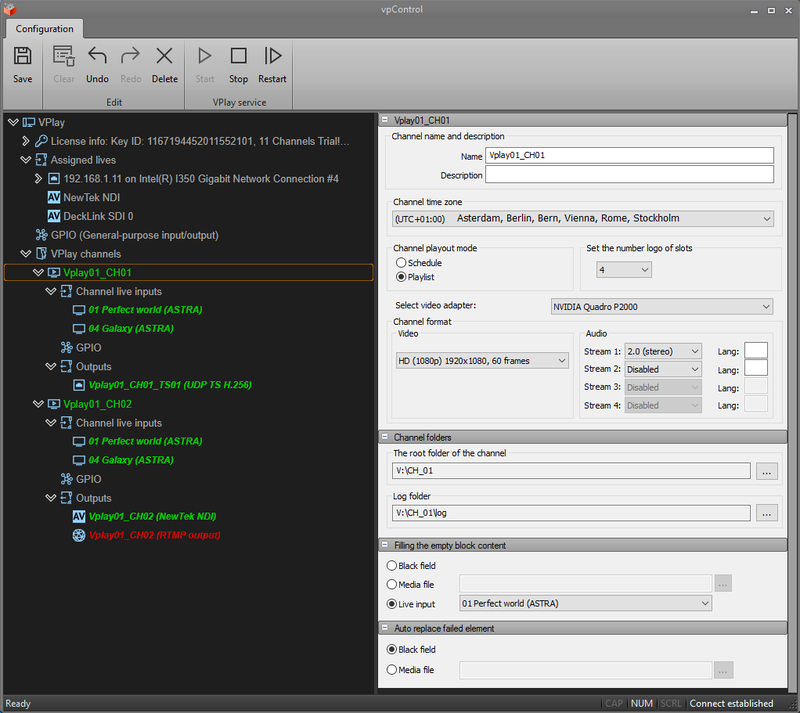 Automated insertion of inter-program and advertisement blocks into scheduled pass-thru AV-signal according to GPI, DTMF signals and SCTE-35 marks. Forming of the scenes in multi-layered approach, individually for each program. 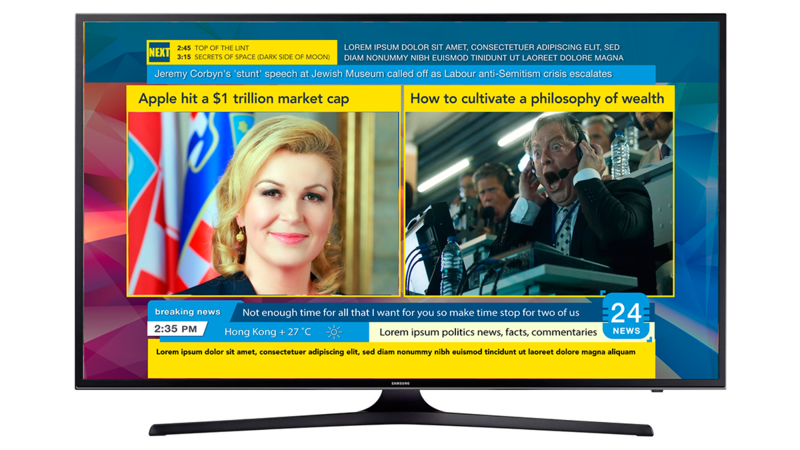 Scenes can consist of titles, crawls, PIP, video effects, logotypes, RSS news, etc. Forming of analog and digital clocks (of any size) with background audio where animation is based on a sequence of TGA files. Application supports circuit boards produced by StreamLabs and BlackMagic. It allows building of broadcast servers with any number and type of input/output interfaces for AV-signals. Codecs: DVCAM, DVCPRO25, DVCPRO50, DVCPRO100, HDV, IMX (30,40,50), XDCAM EX (SP, HQ), XDCAM HD (LP, SP, HQ), XDCAM HD422, DNxHD (36,145,220), AVC/H-264, MPEG2 GOP, Apple ProRes. Graphics design compliments functionality with logotypes and multi-layered scenes prepared in advance. Graphics design is controlled in auto or manual mode with the linkage to primary event in schedule/playlist. Scene can contain many graphics elements, located on the timeline of the scene. Animated /static objects, text, RSS, roll/crawl, analog/digital clock, mask, live source, colored rectangle. Types of external signals, which control input: DTMF, SCTE-35, GPI.